COLOGNE, Germany – Sep 23, 2008 The recent release of Canon’s EOS 5D Mark II DSLR camera represents an emerging trend in digital imaging: the convergence of high-megapixel still photograph and High Definition (HD) video capture in a single digital single-reflex lens (DSLR) camera and the need for large-capacity memory cards to support these added capabilities. With flickr.com now allowing users to post 90 second videos, or “long photos” as they are called, the DSLR video movement has definitely arrived. Canon’s new DSLR camera enables enthusiasts to take professional-grade photos and video, while SanDisk (NASDAQ:SNDK) memory cards provide the robust capacity required to store the resulting data. The groundbreaking addition of HD video capturing capabilities in a DSLR camera opens up whole new avenues of creative expression for users. Point and shoot digital cameras have been able to shoot video for some time, but HD video-enabled DSLRs take such innovation to another level. DSLR cameras offer users increased versatility with the ability to film using a wide variety of lenses. Now video enthusiasts can use a fisheye lens during one shot in order to capture wide hemispherical images, and a telephoto lens during another shot for close ups. RAW images consume up to 10 times as much space as regular JPGs, making an afternoon’s worth of wedding photos or using burst mode at sporting events a memory-intensive affair. 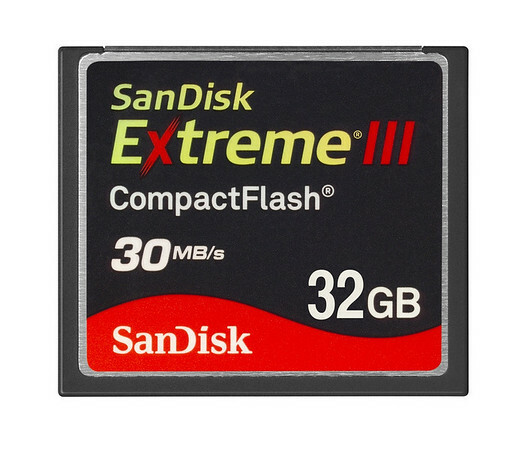 The new 32-gigabyte1 (GB) SanDisk Extreme® III CompactFlash® (CF) card enables photographers to shoot in RAW for extended periods of time without worrying about running out of storage space. Featuring 16:9 Full HD video capture at 1920 x 1080 pixels and 30 frames-per-second (fps), Canon’s EOS-5D Mark II DSLR demands a memory card with the storage capacity required to make such filming both possible and enjoyable. At a whopping 32GB, the latest addition to the award-winning SanDisk Extreme III Compact Flash line can store over an hour and a half of video at full HD resolution. With a 30 megabyte-per-second2 (MB/s) write speed, SanDisk’s card can transfer 32GB of content to a computer in a little over 15 minutes. The SanDisk Extreme III family includes CompactFlash cards that range from 4GB to 32GB as well as the new SanDisk Extreme III SDHC™ and SanDisk Extreme III Memory Stick PRO HG DUO™ cards that recently received a 50 percent speed increase from 20MB/s to 30MB/s. Renowned for their world-class durability, SanDisk Extreme III CF cards possess the industry’s widest guaranteed operating temperature, ranging from minus 13F (minus 25C) to 185F (plus 85C).